I have a adafruit rbg 16x2 lcd with shield kit and am trying to connect it to an arduino uno. The only thing is the assembly instructions have the lcd basically using every pin on the arduino, even tho it says its not for connections. Since we are using many of the pins already on the board, can I wire it to the board without soldering it to every pin, essentially only wiring to the few necessary pins? Sorry, I am very new at this. Thank you for the help. EDIT: Was essentially looking for the follwing diagram. Thanks to all! 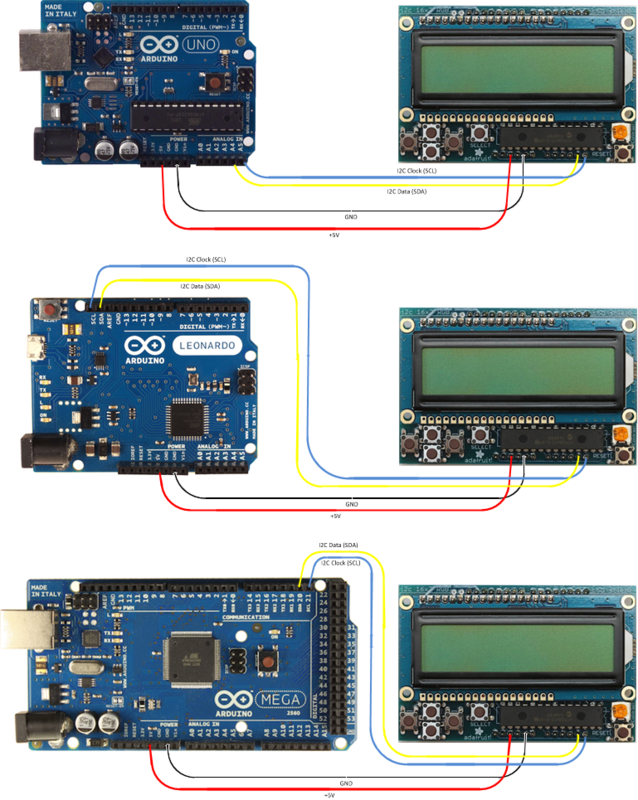 That's why by design every shield connects to every Arduino pin but uses only some of them. That way shield is mechanically well attached to the Arduino, and can pass "unused" pins to the shield above it. Your shield is designed to be always "on top" so I think it only connects to some pins just for mechanical support. Technically the LDC screen needs only 6 pins and 1 pin per button. EDIT: I read now that the shield you got uses only 2 pins and communicates using I2C bus (which is perfect) so I'm 100% sure that it's designed to be on top of the stack and work together with other shields and uses extra pins for mechanical support. Not the answer you're looking for? Browse other questions tagged lcd adafruit or ask your own question. How can I connect more sensors when my lcd is blocking pin access?